After setting worldwide box office on fire for more than a month days, Kgf Chapter 1 is now ready set small screens on fire. The film will be streamed in digital streaming portal Amazon Prime Video from tomorrow in Telugu, Kannada, Tamil and Malayalam which is a delighting news for mass movie lovers. From past few days, netizens have been requesting Prime Video India to stream the film at the earliest. Finally, they have announced to stream the film from February 5th. Like how the film shook the domestic and overseas market, it is sure to create records in digital streaming platform as well. 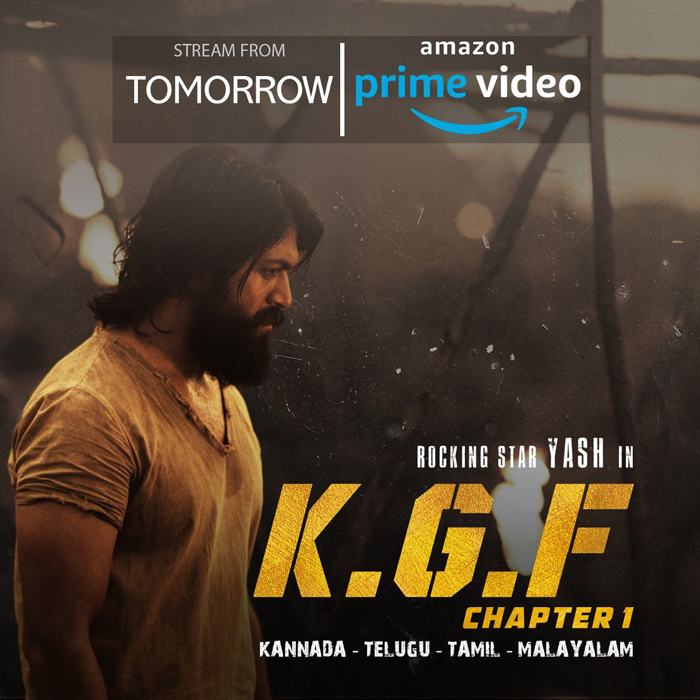 Kgf starring Yash, Srinidhi Shetty is an industry hit in Kannada and it is one of the highest grossers in south cinema. Directed by Prashanth Neel, Kgf will have Chapter 2 which will start rolling from April. Kgf Chapter 2 is likely to release in 2020.